The marine organic carbon content in sediments is a useful tool for reconstructing past productivity in the ocean. Bromine has been proposed as a useful proxy for marine organic carbon, since bromine is more concentrated in marine organic matter compared to terrestrial organic matter. Here, we present a high-resolution Quaternary record of marine organic carbon in the hemipelagic sediments of the Japan Sea obtained during Integrated Ocean Drilling Program (IODP) Expedition 346. We measured the bromine content in the sediments using an XRF core scanner (ITRAX). The total organic carbon content, total nitrogen, and stable carbon isotope values were also measured for discrete samples from the same sediments. The total organic carbon/total nitrogen ratio and the stable carbon isotope ratio of the total organic carbon are used to estimate the marine organic carbon content within the total organic carbon. The Br counts and marine organic carbon content show a high correlation, which we used to construct a calibration equation of the marine organic carbon content from the Br counts. 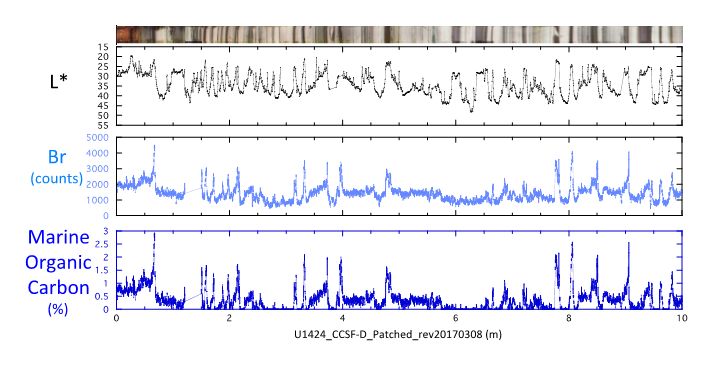 Using the calibration equation, we reconstructed the changes in the marine organic carbon content during the Quaternary with a time resolution of ~ 50&nbsp;years using sediment cores from IODP Site U1424 in the east central Japan Sea. The method to estimate the marine organic carbon content from the Br counts measured by the XRF core scanner proposed in this paper will be a useful tool to reconstruct the organic carbon content with high resolution and high speed.